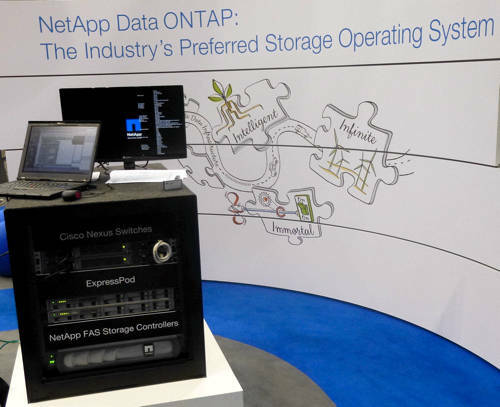 VMworld It looks like the vendors are sizing each other up for battle in the converged systems world at VMworld: NetApp and Cisco have announced ExpressPod, a pre-packed and tested and downsized FlexPod. Storage clustering has been added into the FlexPod mix and Oracle has announced an RAC/VMware FlexPod. Just one day after Hitachi's converged UCP platform was announced, NetApp and Cisco have upped the converged systems' ante and moved downmarket with their ExpressPod as well as boosting existing FlexPods. All with a choice of infrastructure management and hypervisor products. The data centre-class FlexPod converged systems now support vSphere on ONTAP 8 cluster mode, meaning customers can simply add more NetApp storage to a FlexPod configuration to grow the storage pool size. The storage pool supports multi-tenancy and dynamic allocation, good for cloud service providers. Clustering also supports non-disruptive migration of data from old to new arrays, data that could be hundreds of running virtual machines. This aids load-balancing, system maintenance and upgrades. Oracle RAC databases can now run on VMware FlexPods, inheriting all the existing FlexPod goodness. NetApp says that there are now in excess of 1,300 customers after just under two years of availability, plus more than 600 certified FlexPod partners who have access to a Cisco/NetApp help desk for system planning, design and implementation. By moving down into the small and medium biz (SMB) space, NetApp and Cisco are encroaching into the existing SMB businesses of Dell, HP and IBM. We might expect that Hitachi and EMC will respond to NetApp with low-end branded converged system offerings of their own. EMC's Eric Herzog, SVP for product management and marketing, says EMC is already present in the SMB converged system space with VSPEX, since it comes in a VNXe version. One thought: by having converged systems dedicated to specific applications, such as the RAC FlexPod and HDS's UCP Select application-specific offerings we are seeing the introduction of converged system app execution stack silo systems. Whether this is a bad thing or not depends upon future needs for general purpose systems.